i love that --the insisting that you spell the elephant's sound correctly! what a smarty pants! 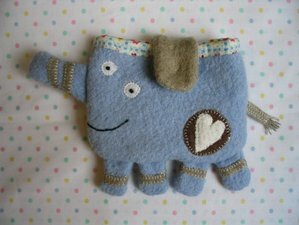 i followed a link here from... wee wonderfuls, i think.... your elephant is amazing and i love your blog. i'll be back! I would spell the sound an elephant makes as, "Aaaarrrungh!!" or "Eeerungh! ", depending on the elephant. I asked my husband who makes the best animal noises for Oscar. He came up with prruuumph! According to two young friends of mine from Chile, an elephant says, "Prrraaaahh, Prrrraaaaahhhh." mpbpbpbaraah! Aren't elephants afraid of mice? I see I'm not the only one to follow Wee Wonderfuls link to your wonderfulness! I couldn't stop smiling at the kitty purse and don't know if I'll recover from the elephant. I think it goes--"PPPHHHHHHHWWWWAAAAAHHH". Check with the cartoon "Little Bill", he does a mean elephant. :) Look forward to more of your great creations. Oh Micheal and Matilda are such heartbreakers! I want to play but there are so many good spellings out there...I'm just going to play and not to win, is that ok? I was wondering, if Michael is an Asian or an African elephant? You might get Molly thinking about this one. Asian elephants have a unique chirping sound. Both types of elephants have many sounds, including the trumpet, which can be heard 5 miles (8 kilometers) away. They also communicate with their stomachs (I like that idea). The contented elephant makes grumbling tummy sounds. Other sounds are a scream and rumbles. Their trunks have over 40,000 muscles so they can use them to knock down a tree or pick up a piece of straw. I have 2 sons and we learned a lot about elephants. I just love them, and my sons too! Anyway, your purses are adorable. I have a little pink organza ruffely apron that if your husband would still like to see you in, I would love to trade! i want one!! :O) so so so adorable! hoe that pile gets bigger as you make more! I'd say that an elephant says something like Rrrrroooooooooot! Or something. That one is cuter than cute, whatever he says. Oh they are too cute. I was hooked when I saw the drawings the other day.! oh! 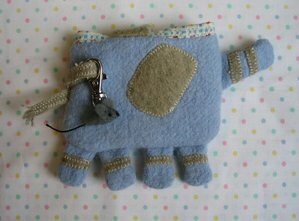 i can't imagine how an elephant would sound in english, but i'll try anyway... the purses are too cute! this is how an elephant would sound in spanish (i think!) PRRRRRREEEETTT!!!! Love the purse. At our house an elephant noise is "stomp! stomp!" I asked my 1, 3 and 5 year old boys and they all came up with the same answer which is basically a 'Rrrreeeerrghh'. Not like a lions roar but a more high pitched sustained noise. We had fun anyway...I love the little purse! So beautifully made and as unique too. You are definately NOT the only one that crafts instead of doing housework. My kitty likes to sleep on top of the ironing plie and thinks she's queen of the castle she's so high up! As for the elephant noise, how about "PHRRRRRRRRRRRRRRRRRRRRRRRRRRRRRRRRRRRRRR!" ? Wow again! Michael and Matilda are just fabulous. I've put some thought into the elephant noise, too (and engaged the opinion of an almost 2 year old) and we think the elephant sound is something like "BWAAAAAAARRRGH"... although our Australian accents may have gotten in the way of a culturally-correct interpretation! Okay, I love that little guy - too cute. Here is my take on the sound: You have to clench your teeth and keep your lips pressed slightly together so that the sound pushes through... and say "BBBBBBBBBBBBEEEEEEEEEEEEEEE"
Wow...that elephant is one of the CUTEST things I've ever seen. So original and whimsical. I love it! so so so cute! I thought I was the only one who evaded the housework! Oh, goody a contest! I wanna win! Well, considering I've seen the Heffalump movie numerous times over with my boy--I think the official sound made by Lumpy, a heffalump himself is T-R-U-M-P-e-T-T-R-U-M-P-e-t-t-Y-D-e-e.
Goodness me, I couldn't even begin to guess how to spell an elephant sound. Michael the elephant is very handsome. You're so damn clever! kids ask the darndest questions. hi! i just love this elephant! it's the most beautiful creature i've ever seen! adorable! can i buy it? please? i'll love to have him in my house, i think we 'll be very happy together!!! as much as i'd love to win the elephant for myself, i really like sarah's suggestion of huraaamph. it seems particularly well-suited for mr. michael. This is an amazing little bag Lyn. Love it, love it, LOVE IT! I found my way here from weewonderfulls too. As for an elephant noise, i would spell it kinda like someone blowwing their nose!! nnnhhhhhhhhherrrrrrrr. But once i have given it more thought i may come back. My hubby say vvrrrrruuuuurrrrrr, which i quite like. My 5 years old daughters elephant noise comes out as alot of spit!!!!!!!! Believe me, I really understand you. When I start beading I can't think about anything else, even work home. Bahhhh! They "bray". That's what I've always called it. I'm a big fan of the elephant purse considering that my favorite animal is an elephant.But I've been thinking. O.K. here goes think that an elephant sounds like this rrrrrrrrrrrrrraaaaaaaaaauuuuuuurrrrrrrr. ok i gave it my best shot!!!!!!!!!!!!!!! but from wht i hear id have to say its a "PHHHMMMMMMFFFFFFF"